There is a great photo story (although there doesn’t seem to be accompanying text) on Hetq Online of historical buildings in Yerevan. Many of these marvelous structures are located in what remains of the district known as Old Yerevan in the areas around and behind Republic Square. Before long, most of them will undoubtedly come down completely; in some cases only the facades are left, propped up with wooden studs. Nowadays there’s this “out with the old, in with the new” sentiment being fostered that future generations will likely resent. A few historic buildings have been restored or else have mutated into horrific, monolithic structures — the Escada building near the Vernissage is a prime example of that — see below. It’s been transformed into a heartbreaking abomination. 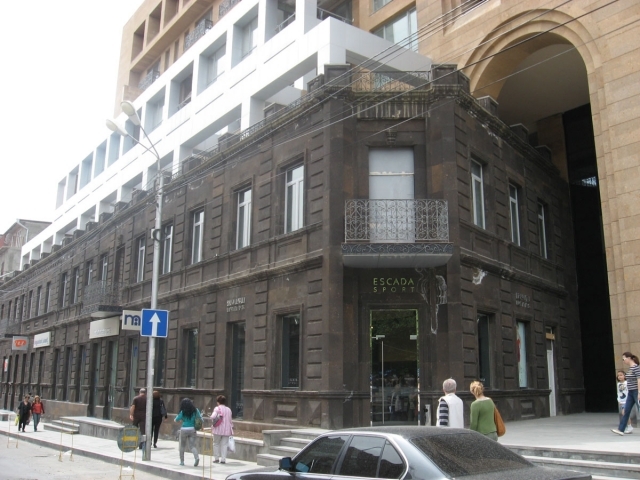 The Escada building in Yerevan, near the Vernissage. Ararat Davtyan photo. Then there’s the Tashir Pizza building on Tigran Medz Street, which if I am not mistaken housed parliament during the first republic, and from the balcony on the corner independence was declared. Now it’s a restaurant serving mediocre, overrated food. Disgraceful. The Armenian Assembly of America was responsible for the renovations and the additional upper floors with their bland, pale exterior that doesn’t come close to matching the original architectural design. If only they had restored it more tastefully and chosen its tenants wisely. They’ve managed to mock modern Armenia’s brief history rather than preserve it. 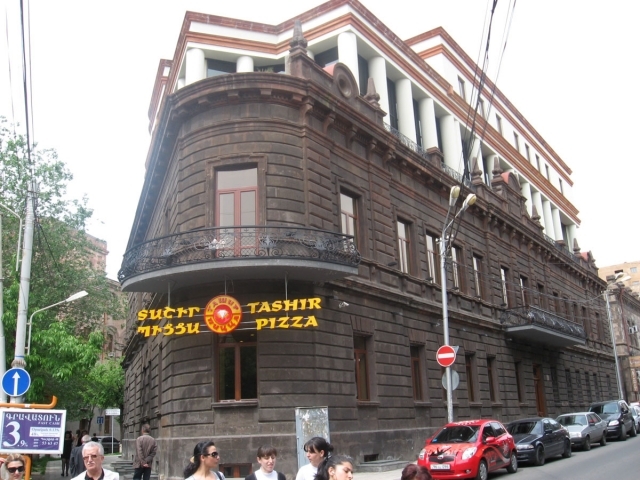 The Tashir Pizza Building on Tigran Medz Street in Yerevan. Ararat Davtyan photo. The building where I live on Hanrabedutyan Street, which was not photographed, dates back to the 1930s, when they still knew how to erect solid buildings with integrity. The walls were made from huge chunks of rock, whereas now they use cheap cement blocks riddled with air holes that start to crumble when you touch them to construct high-rise apartment buildings. Two years ago the Yerevan municipality wanted to do the tenants a favor by repairing the unique half-circle balconies. My landlord, who is a all-around nice guy, foolishly agreed, while others opted out. His concern was a crack that was found on the inside wall, which only needed to be closed up with some cement to repair it. They had to use a jackhammer to take the concrete apart, the process of which took a couple of hours. The balcony wall was at least six, perhaps eight inches thick, and it served as a convenient table as well for drinks and an ashtray. Now it is about an inch or two thin, and the cement that was poured unevenly and sloppily of course is already disintegrating, with air pockets clearly visible from the inside. After a rainstorm there’s always cement dust on the balcony floor. No one cares about quality any more. You can see the photos on Hetq Online by clicking this link. There’s also an NGO called Old Yerevan: Gone But Not Forgotten, which has a Facebook page. Among the few rifts that exist between people from the Armenian diaspora and citizens of the Republic of Armenia are the nuances of language. There is an ongoing debate, although perhaps not well publicized, about which Armenian is “proper” — that which is taught and spoken throughout the diaspora, known as Western Armenian, or the Eastern Armenian dialect spoken by those born in the Armenian republic and elsewhere, like Iran. The notable differences between the two dialects, particularly in vernacular, are such that it can be quite difficult for Armenians from opposite sides of the world to understand one another. Conversational Armenian spoken in the republic is often riddled with Russian words and phrases and also borrows some lexicon from Turkish as well as Farsi. Spoken Western Armenian, on the other hand, is often sprinkled with Arabic or Turkish expressions by those from the Middle East, while Armenians in the US may use English or Turkish words to name something, like food or clothing. Yet bring two people together, each speaking a different dialect, and you may find gaps in comprehension between them. Unless pure, literary Armenian is spoken, which may not be the case between a tourist visiting Armenia and someone working in the service industry, the dialog could break down in frustration, with either side concluding that the other cannot speak properly. This phenomenon does exist, and rather than bringing Armenians together, it can have the opposite effect, pushing resentment and misunderstanding to the fore. Of course Armenians from either side of Mount Ararat take pride in the language. Both sides equally laud Mesrob Mashdots for creating the alphabet at the dawn of the fifth century and praise the giants of Armenian literature with devout following. Yet the variances in pronounciation, grammar and even spelling can be confusing. The sounds of several letters have been switched, for instance p and b and, most remarkably, ts and dz. Perhaps the most intriguing issue of contension between the two dialects is the word representing the verb “to be” — transliterated as linel in the Eastern dialect and elal as used in Western Armenian. I have yet to understand how the two terms to mean the same thing — the very act of being — were put into use, and no one that I’ve asked in the literary world seems to know. Even the simple present third person singular form of “to be” is pronounced differently — “eh” as spoken in classical and modern Armenian versus “ah” commonly used in Eastern Armenian, which has even found its way into print. There are also notable differences in verb conjugation and overall sentence structure. The infinitive suffix of many verbs, -il, was phased out of the Armenian spoken in the republic, replaced by one of the two other variants. Some words seem to have an extra syllable or have been altered to some degree, for instance the verb “to learn” — sorvil in Western Armenian versus sovorel in Eastern. Communication is necessary for the common exchange of ideas, it is essential for creating bonds between two or more individuals or groups regardless of ethnicity, spirituality or ideology. Communication in any form, especially electronic in modern times, is defining how the world is being shaped today. It also traces the development of human ingenuity and thought. Thus, the inability to convey thoughts and emotions between individuals speaking the same language leads to fragmentation and alienation in society. The Armenian language in some ways is finding itself struggling to survive. Outside of Armenia, the language is arguably decreasingly being used within the confines of diaspora-based communities. The efforts to teach new diaspora-based generations in speaking and reading the language has always been challenging with the temptation to assimilate always looming. Even in the republic properly spoken modern Armenian, known as ashkharabar, runs the risk of being detrimentally transformed in the next few decades as the slang spoken by the youth and even middle-aged generations, what I call “Street Armenian,” is being spread via televised programming, which is in turn broadcast via satellite and viewed by diaspora-based communities. In e-mail and messaging correspondence the Latin alphabet is used in place of the Armenian for matters of convenience and compatibility between various computing platforms. In Armenia I found it problematic for people to understand the most rudimentary words commonly spoken in Western Armenian but have been replaced by their Russian (or indirectly, French) counterparts. Even stranger, words I have learned from Eastern Armenian dictionaries are sometimes (albeit rarely) not understood when I use them in conversation. Moreover I often have difficulty trying to decipher what teenagers and young men are talking about, and some of them will potentially be the leaders of Armenia, which is disconcerting. Thus there needs to be a commonly spoken Armenian taught and spoken around the world. A consortium should be formed composed primarily of educationalists, modern literary figures (including publication editors), and linguists. 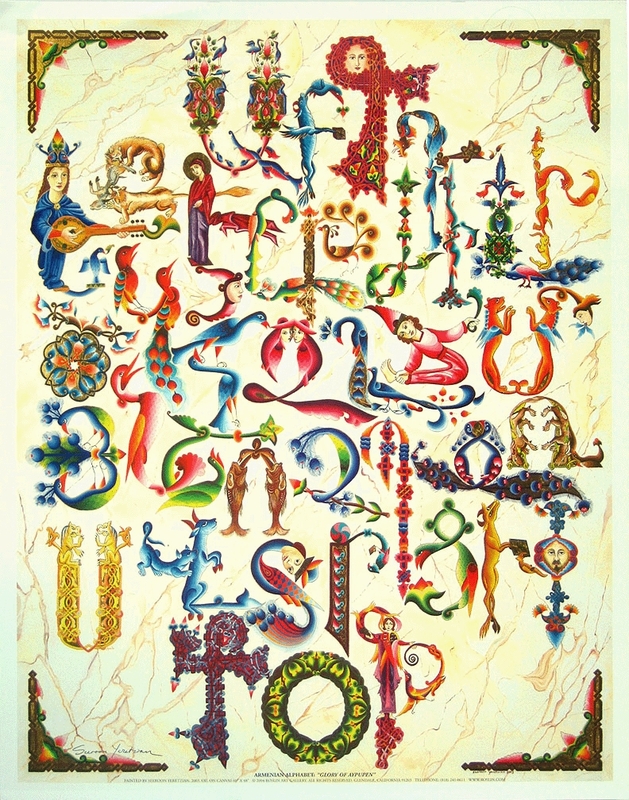 Such a consortium should be charged with developing a modern, commonly spoken and written Armenian language used universally, thereby eliminating both dialects in favor of a single, concise comprehensible tongue (village and regional dialects should be excluded, even promoted to thrive–variances in vernacular and grammar can be found in arguably any society where a common language is spoken). Once the dust has settled and a consensus has been reached, the language should be adopted officially by the Republic of Armenia and in all diaspora-based communities where the Armenian language is taught. Obviously, this will not be an easy task and it will probably take years for a consensus to be reached, which makes it all the more essential that efforts get underway without haste. The Armenian language needs to survive, and in order to do so it needs to adapt to changing times and alternative ways of communication. Given the current (and future) technological trends in how we communicate, along with the regional dynamics in perpetual flux, it is already running the risk of becoming nearly extinct in the next century or two. But by synthesizing the two diverse forms of Armenian speech, the risks of losing the language to the race with technology and the struggle against assimilation decrease dramatically. It’s still not too late to start. What do you think — should the two dialects remain being spoken/written or is it better to have one dialect used universally?